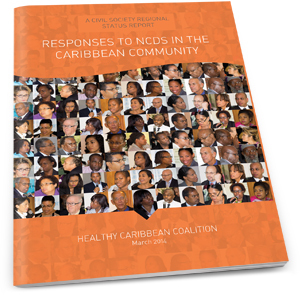 Today Thursday March 20th, 2014 the Healthy Caribbean Coalition officially launched: A Civil Society Regional Status Report: Responses to NCDs in the Caribbean Community. This project, the completion of a Regional Status Report from the perspective of Civil Society, is part of the work of the NCD Alliance’s programme, ‘Strengthening Health Systems, Supporting NCD Action’ which aims to support and strengthen civil society NCD advocacy efforts in Brazil, South Africa and the Caribbean Community (CARICOM). The Healthy Caribbean Coalition (HCC) is the “National Implementing Partner” for the Caribbean in the implementation of this project funded by Medtronic Philanthropy. The purpose of this report is to understand and assess the Caribbean response to non-communicable diseases (NCDs), from a civil society perspective. The findings and the emerging call to action will serve as an evidence-base, and platform, from which a more empowered civil society can better influence and complement regional and national NCD policies and programmes. This document represents an important regional resource which can be used by national governments and regional entitites as an evidence base for priority NCD policy and programming and as a roadmap for civil society organsations in the Caribbean to develop targeted NCD advocacy campaigns. The report is unique in many respects not the least of which is that it represents the first occasion, that CSOs in the Caribbean have come together to produce an in-depth and comprehensive assessment of NCDs as viewed through the lens of civil society. This is an important step in the development of a process and culture that seeks to lead to strong advocacy efforts by the people of the region for improvements in all aspects of health. It is an occasion for celebration by HCC and civil society as we reaffirm our commitment to continue to support the NCD response at organisational, national, regional and global levels in the sixth year of the formation of the HCC - a Caribbean NCD Alliance. We urge you to share this important occasion for the NCD response in the Caribbean within your networks. Click here for the Official Press Release and here for the Executive Summary of the Report. The full report will be available on the HCC website on Friday March 28th, 2014.